The calcaneus, also called the heel bone, is a large bone that forms the foundation of the rear part of the foot. The calcaneus connects with the talus and cuboid bones. The connection between the talus and calcaneus forms the subtalar joint. This joint is important for normal foot function. The calcaneus is often compared to a hard boiled egg, because it has a thin, hard shell on the outside and softer, spongy bone on the inside. When the outer shell is broken, the bone tends to collapse and become fragmented. For this reason, calcaneal fractures are severe injuries. Furthermore, if the fracture involves the joints, there is the potential for long-term consequences such as arthritis and chronic pain. How do Calcaneal Fractures Occur? Most calcaneal fractures are the result of a traumatic event—most commonly, falling from a height, such as a ladder, or being in an automobile accident where the heel is crushed against the floorboard. Calcaneal fractures can also occur with other types of injuries, such as an ankle sprain. A smaller number of calcaneal fractures are stress fractures, caused by overuse or repetitive stress on the heel bone. 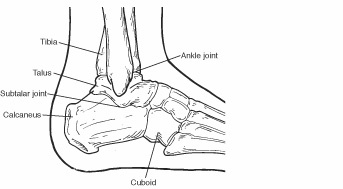 Fractures of the calcaneus may or may not involve the subtalar and surrounding joints. Fractures involving the joints (intra-articular fractures) are the most severe calcaneal fractures, and include damage to the cartilage (the connective tissue between two bones). The outlook for recovery depends on how severely the calcaneus was crushed at the time of injury. Stress fractures, caused by overuse or mild injury. 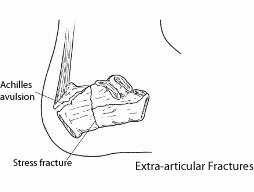 The severity and treatment of extra-articular fractures depend on their location and size. Calcaneal fractures produce different signs and symptoms, depending on whether they are traumatic or stress fractures. To diagnose and evaluate a calcaneal fracture, the foot and ankle surgeon will ask questions about how the injury occurred, examine the affected foot and ankle, and order x-rays. In addition, advanced imaging tests are commonly required. Treatment of calcaneal fractures is dictated by the type of fracture and extent of the injury. The foot and ankle surgeon will discuss with the patient the best treatment—whether surgical or non-surgical—for the fracture. Rest, ice, compression, and elevation (R.I.C.E.) Rest (staying off the injured foot) is needed to allow the fracture to heal. Ice reduces swelling and pain; apply a bag of ice covered with a thin towel to the affected area. Compression (wrapping the foot in an elastic bandage or wearing a compression stocking) and elevation (keeping the foot even with or slightly above the heart level) also reduce the swelling. Immobilization. Sometimes the foot is placed in a cast or cast boot to keep the fractured bone from moving. Crutches may be needed to avoid weightbearing. 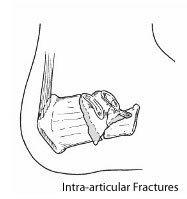 For traumatic fractures, treatment often involves surgery to reconstruct the joint, or in severe cases, to fuse the joint. The surgeon will choose the best surgical approach for the patient. Whether the treatment for a calcaneal fracture has been surgical or non-surgical, physical therapy often plays a key role in regaining strength and restoring function. Calcaneal fractures can be serious injuries that may produce lifelong problems. Arthritis, stiffness, and pain in the joint frequently develop. Sometimes the fractured bone fails to heal in the proper position. Other possible long-term consequences ofcalcaneal fractures are decreased ankle motion and walking with alimp due to collapse of the heel bone and loss of length in the leg. Patients often require additional surgery and/or long term or permanent use of a brace or an orthotic device (arch support) to help manage these complications.